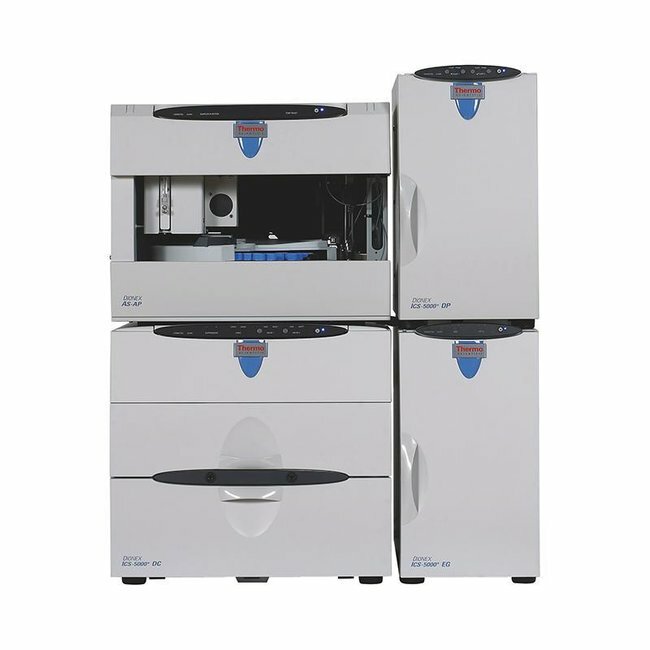 Get significant increases in resolution and throughput using the world’s first modular ion chromatography (IC) system capable of operation up to 5000 psi. The Thermo Scientific™ Dionex™ ICS-5000+ Standard Bore and Microbore System can operate continuously at up to 5000 psi when configured as a Reagent-Free™ IC (RFIC™) system. Get higher resolution using smaller particle size (4μm) columns, faster run times without sacrificing needed resolution using higher flow rates and 150mm columns, or higher resolution with standard flow rates and 250mm columns. Configure this flexible, modular system to fit your needs. Achieve best-in-class resolution, speed, and sensitivity—optimized for your capillary ion chromatography (IC) methods. Configure the modular Thermo Scientific™ Dionex™ ICS-5000+ Capillary HPIC™ System with a choice of single or dual IC channels, detectors, and automated eluent and sample preparation options. The system’s high-purity, electrolytically generated eluent and time-saving Thermo Scientific™ Dionex™ IC Cube™ cartridge consumables ensure exceptional control and reproducibility for isocratic and gradient separations, and months of continuous operation using minimal eluent. Get best-in-class resolution, sensitivity, and throughput for even the most complex ICxIC (2D-IC) methods and trace level analyses. The versatile Thermo Scientific™ Dionex™ ICS-5000+ Hybrid HPIC™ System provides faster separations without compromising resolution, thanks to its dual high-pressure channels: one optimized for capillary flow rates, the other for standard (4mm) or microbore (2mm). You’ll save time and improve reproducibility with precise, automatic eluent generation and sample preparation. Choose from a wide variety of chemistries, detectors, and automation options to fit your needs.